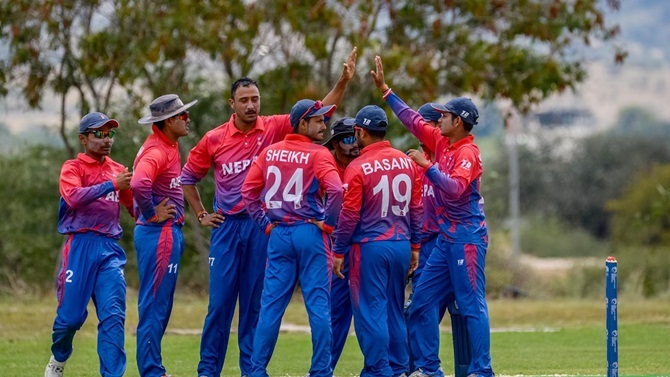 Nepal secured a historic entry into the upcoming World Cup qualifiers after a sensational last-ball one-wicket victory over Canada in the ICC World Cricket League Division Two in Windhoek (Namibia) on Wednesday. Chasing a modest 195, built around Srimantha Wijeratne's unbeaten 103, Nepal were staring down the barrel at one stage having lost nine wickets for 144. However, the last-wicket pair of Karan KC (42) and Sandeep Lamichhane (5) added 51 off the last 47 balls to pull off victory. Nepal needed eight runs off the last over and Canada medium-pacer Cecil Parvez delivered four dot balls, before Karan smacked a six off the fifth. Earlier, Wijeratne's maiden List A hundred helped Canada post a modest 194 for eight as Nepal spinners Basant Regmi (3/34) and Lamichhane (2/40) kept the opposition batsmen under a tight leash. The win was Nepal's second last-wicket heist of the tournament, and took them to four wins in five matches on the points table. The UAE also bagged a spot in the World Cup Qualifier by defeating Namibia by 19 runs. Batting first and losing a couple of early wickets, the middle order restored the innings, scoring 247 runs for six wickets in their 50 overs. Shaiman Anwar (77, 59b, 5x4, 3x6), Muhammad Usman (59), Ghulam Shabbar (44) and Rameez Shahzad (33) all contributed with crucial runs, as JJ Smit was the pick of the Namibia bowlers with three for 57. Gerhard Erasmus (58, 63 balls, 3x4, 2x6) was yet again the stand out batsman, whose attempt to get Namibia across the line was not quite enough. Craig Williams (54) and Lohan Louwrens (43) got the hosts within touching distance of the winning target as the overs started to run out for the African side. As the run-rate increased so did Namibia’s need to get runs, and the UAE bowling line up took full advantage, taking wickets at crucial times. Amir Hayat (3-49), Ahmed Raza (2-30) and Rohan Mustafa (2-30) all chipped in with vital wickets as Namibia fought until the end before losing by 19 runs.